Most libraries have or sponsor a book sale. Some are low key, on going in-house events while others (like in Guelph) are huge annual events that rock the whole community. A great planning team with a leader who has the vision and skills is essential to be successful. There needs to be a compelling reason. For the Friends of the GPL , it is to furnish and equip the teen area of the new main library. Customers are much more likely to support an event if they know what the money is being used for. ►To lead, organize, sort, sell, promote and count the cash. In its 7th year the GPL Friends have over 200 volunteers who work on the book sale. ►Volunteers of all ages….teens, working and retired folks…there needs to be volunteer opportunities and times for them all. Loads of books: about 1 % of the books for the sale come from the library, the rest are donated by the community. The library serves as a collection point for the weeks leading up to the sale. A great location that can be used for the 2 months leading up to the sale. And ideally the same location year after year really helps. A great marketing team to plan and get the community excited about the sale. 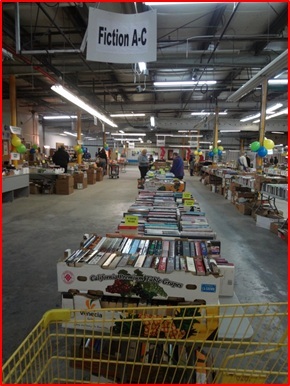 One of the secrets to the success of the Guelph sale is all the books are sorted into subject areas including: fiction, kids, music, nonfiction from animals to sports …and of course cookbooks and local history. It is this sorting that makes the sale such a success. Great sales people on the sale floor. Folks who really know kids literature are the best people to sell picture books! Even though it is a used book sale…the Friends spend significant time making sale tables look interesting and as books are sold, replenishing the table. We eat and buy with our eyes!!! With huge CD, vinyl and sheet music sections, volunteers keep peppy tunes filling the air. Add the smell of freshly brewed coffee and you have lots of reasons to hang out and brows the sale tables. The longer customers stay, the more they buy! The most asked question at the book sale is what are you doing with the stuff that isn’t sold? Have a clear plan for the leftovers. People want to know it is being recycled and it is not going into the landfill. Patience. It has taken the Friends of the GPL seven years to perfect their book sale efforts. The result is they are half way to their $500,000 goal. The library, the recipients of all this hard work, needs to be supportive and responsible for a piece of the work. 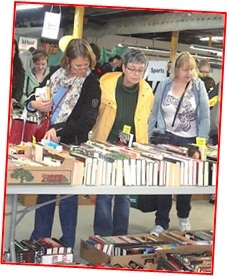 GPL is a collection site; we help with the marketing, assist finding volunteers and are on site sale days. But, most importantly, we thank all the volunteers and book donors for their support. We thank, we thank and then we thank them again!!! The secret to a great book sale is great friends!